From China, introduced in the Heian period, probably aready the Yayoi period. The Chinese name, when used as a medicine, is gaishi 芥子（生薬名：がいし) and refers to the seeds. The leaves also have a strong taste and are eaten as a vegetable. 100 g contains 26 kalories. proteines 3.3g、fat.1g、carbonides4.7g、fibers3.7g、carotin2800μg、Vitamin E 3.1mg、Vitamin 260μg、Vitamin B1 0.12mg、VitaminB2 0.27mg、Niacin 1.2mg、Vitamin B6 0.25mg、folic acid310μg、panthoten acid 0.32mg、Vitamin C 64mg、natrium 60mg、calium 620mg、calcium 140mg、magnesium21mg、phosphor72mg、iron2.2mg etc. Different types grow in various regions. It has a strong hot taste. The following items are not kigo. karai からい　... is a word to imply HOT, spicy food. The seeds of the mustard plant are small and round. It comes in tubes as a paste ready to use or in powder form to prepare fresh for each meal. This type comes from a different plant. It is much less pungent than "Japanese mustard" 和がらしwagarashi and has more of a vinegary taste. It comes in a white and a brown version. The origin was the plant from the Dijon area, where even today all kinds of mustard are made with wine-vinegar. All kinds of Western mustard are available in Japan.
. . . CLICK here for Photos of mustard seeds!
. . . CLICK here for Photos of some dishes! It is also used to pickle other vegetabels. A pickling bed is made of "sakekasu" and mustard. Pickle salted vegetables in the bed. Red peppers and sesame seeds can also be used. Lotus Root with Japanese Mustard, sometimes fried. Sometimes white miso, kamaboko ground fish paste and katsuobushi are used for the filling. When the daimyo of Kumamoto, Hosokawa Tadatoshi, 細川 忠利 became sick, a priest from the temple 豊前国耶馬溪羅漢寺 in Bungo told his aides to prepare some lotos roots for him. 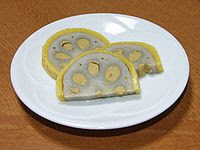 One of the kitchen crew, Heigoro 平五郎, remembered that Kato Kiyomasa had some lotus planted in the moat of Kumamoto castle as food for emergencies, so they took some out filled the holes with a paste of mustard powder, wheat miso paste and egg yolk. They fried this in oil and offered it to the ailing lord, who ate it with gusto and became well soon. Rather famous in many areas of Japan. Prepared in many regions famous for shiitake growing. Dishes from Yufuin, Oita, Kyushu. Since there grows no Japanese horseradish (wasabi) on the islands, this sushi is usually served with mustard (karashi) or hot pepper. Best prepared in spring for the Doll Festival. Boiled with shells and asari shells, white miso, karashi mustard, sugar and vinegar. This is made from wasabi, Japanese horseradish. spicy mentaiko (辛子明太子, karashi mentaiko). toogarashi 唐辛子 chilli peppers "Chinese karashi"
The "Children of Edo" liked the first expensive bonito of the season, cut in sashimi and with a dip of Japanese mustard. There was an old way to prepare the mustard seeds by grinding them fine, then put a piece of paper on top of them and add hot water. Now a redhot piece of charcoal is added to the pot and the whole stays over night. The charcoal takes on the pungency of the mustard, and a fine fragrance remains. ***** . Mustard greens, Senfkraut (takana 高菜) .